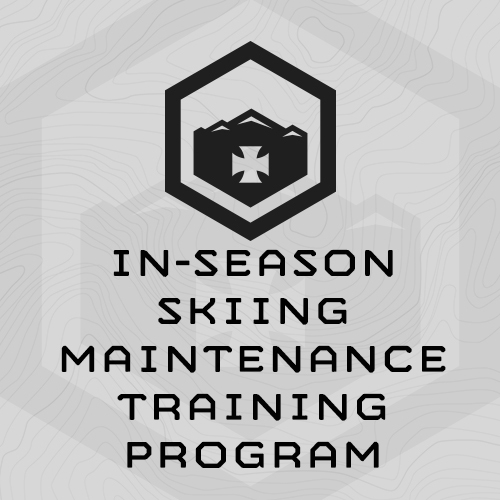 This training program is specifically designed to maintain ski fitness during the ski season for mountain professionals (ski guides, ski patrollers) and weekend warriors. This program trains athletes 2-3 days/week, over 12 weeks. It contains 36 total training sessions. The program is designed for both Ski Professionals, who work on the ski hill 5-6 days/week, and Weekend Warriors, who hammer the slopes on Saturday and Sunday. We recommend Ski Professionals train two days/week, Tuesdays and Thursdays. The training sessions for both days focus on strength maintenance for the “mountain chassis” (legs/core) and durability. We recommend Weekend Warriors train 3 days/week: Tuesday, Wednesday, and Thursday. You need a fully-equipped gym to complete the plan, including barbells, plates, dumbbells and/or kettlebells, 20” plyo box, pull up bar, etc.